LIBERAL, Kan. – It was another runaway victory for the No. 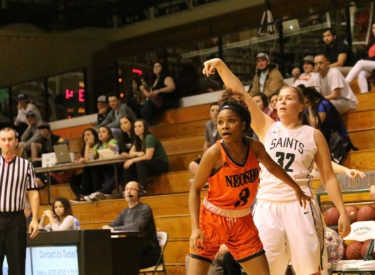 6 Seward County women’s basketball team, as they defeated Neosho County 77-52 inside the Greenhouse on Wednesday night. Sophomore Mollie Mounsey came away with 24 points in the game, pushing her into the Top 5 on the all-time scoring list for the Lady Saints. Mounsey currently has the fourth most points in Seward County history with 1,176 career points. It wasn’t the start that Seward County (24-2, 20-2) excepted, falling into a 10-4 hole in the first three minutes of play. Lexi Hernandez hit a jump shot to kickstart a 15-2 run over the remainder of the quarter to give Seward a decisive 19-12 lead after one quarter of play. The Lady Saints continued their scoring spree to start the second quarter, scoring eight points in just over two minutes of play. Back-to-back three’s by Mounsey, followed by an Amy Scott jump shot put the Lady Saints up twenty with just over three minutes left in the half. Seward extended the lead to 21 just before the half with two Mounsey free throws to take a 41-20 lead into the break. Seward shot 37.1 percent (13 of 35) from the floor in the first half and just 20 percent (3 of 15) from behind the arc. Although their offense was off target, their defense held Neosho to just 23.5 percent (8 of 34) from the field and 23.1 percent (3 of 13) from deep, while forcing the Panthers into 17 turnovers. An 8-0 run by Amy Scott pushed the lead to thirty points late in the third quarter, by a score of 61-31. Valerie Caro gave the Lady Saints their largest lead of the night with a jump shot, putting Seward up 34 points. The Panthers came out in the fourth quarter by going on a 12-2 run to cut the lead to 22 points, by a score of 67-45. However, the Lady Saints pushed the lead back up to 25 by the end of the game, winning by a score of 77-52. Seward finished the game shooting 38 percent (27-71) from the floor, but only 23.3 percent (7 of 30) from behind the arc. The Lady Saints held the Panthers to just 25.7 percent (19 of 74) from the field and 30.4 percent (7 of 23) from deep. Seward came away with 21 steals and forced the Panthers into 31 turnovers. Along with Mounsey, Amy Scott finished with double-digits points, scoring 10 on the night. All but two Lady Saints contributed points. Seward will travel to Independence at 4:00 p.m. on Saturday (Feb. 17) to take on the Pirates in what will be a highly contested game. The Lady Saints currently hold a two-game lead over the Pirates for the Jayhawk Conference lead. Independence will stream the game and it can be heard on 107.5 KSCB with Brock Kappelmann (pxp) on the call.